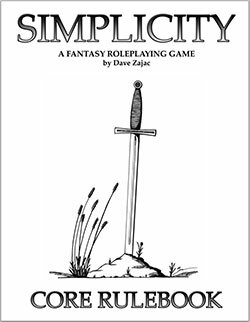 Simplicity by Dave Zajac (aka Swordfin Games) is a fantasy roleplaying game system for those who have an inner wrestle between modern fantasy roleplaying games an old school ones. In the 70s corner is your flared corduroy self with huge mutton chops, tight rainbow jumper and CND medallion. In the modern corner is you in neon Lycra and electric blue Anime hair. You want both. You want the comfortable feel of the stripey sweater your wife burnt and you want the Lycra catsuit you should have stopped wearing years ago. Can Simplicity give you that? Old school but modern? Like retaking high school when you're 40? Simplicity isn't. Great name but not true. It's not a monolith but it's not simple. That's OK, I like my RPGs like I like my salad: with some crunch. I'll explain as I go through but let's get that out of the way. If you want simple, pick up Risus or Warrior, Rogue and Mage. The first old school trope to be jettisoned are classes and races. Your avatar is built old school style from Body (dancing, carrying, punching), Mind (thinking, arguing, magicking) and Spirit (cajoling, cavorting, commanding). Each is a number between 8 and 23, which gives a modifier and other side-effects such as how much you can carry. From there, you calculate speed, damage reduction, health, equipment and abilities. Abilities (skills) use a skill tree system and each ability changes the rules of play in some way (more on this). No wishy-washy story-driven life generation or other such modernity here. It's stock old-school. 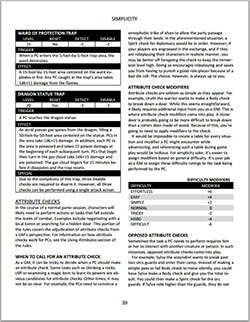 Performing actions in Simplicty is simple: roll d20, add modifiers larger than 10. If you're hitting something, your weapon will have a die to roll, subtract the enemy's damage reduction (based on armour) and they take that many hits to their health. The old school is booted again with levels being the decision of the GM, not through hacking monsters. So, where is the complexity then? I harp on all the time about crunch entering through the back door. A resolution mechanic can look innocuous (this certainly is) but once you add the skills/abilities to the game, the number of ruling combinations explodes! I like this sort of crunch. It works for me. This does make the system more complicated because the folks around the table have to keep track of all the effects on the rules of the different abilities. Complexity has also crept in with book keeping (weights for everything, including coinage). The rulebook feels scattergunned with rules. I would prefer a more ordered layout, particularly extracting all the inline rules (actions, combat, magic) out of character generation and into another chapter. I'd much rather refer to the combat chapter during character generation than have to root through character generation during a combat. I'd also like examples made obvious, perhaps by boxing them out. I'd like some more pictures too. Dave drew the cover, which is lovely! Let's have more of that. Not terror, you heathen; terroir. The book grows out of excellent writing, a neat and not-fussy layout, a GM section that tells you how to build monsters and balance a game. There's even a map. 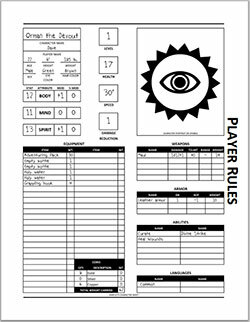 Dave goes further on the website, where you can download a starting adventure, character sheet and optional rules. There's even a back page. If you fancy buying a hardcopy (which I view very much as a time saver for cash-to-burn hobbyists like me) then he provides that too. 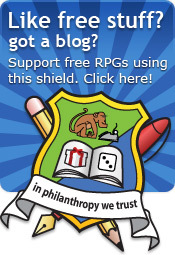 It is a laudable goal to create a simple roleplaying game. However to create a playable game with just the right level of crunch is no less worthy. Simplicity isn't and that's OK. That's more than OK. This is a well written RPG that has the crunchy elements of the old school while chucking out other tropes with cavalier freedom. It sets out to modernise the old school without washing out any flavour and I feel it succeeds that tricky goal with aplomb. Dave, thank you for sharing! It feels very much like early DnD, except with feats. It's cool that there are monsters, magic item creation, trap stats and even world creation advice included.